“In 1912, German meteorologist Alfred Wegener first put forward the theory of continental drift to describe the movement of major landmasses across the surface of the planet. Initially, the theory was widely criticised but then later absorbed into the current, accepted model of continental dynamics known as plate tectonics. Continents move at slower than a snail’s pace, like pieces of a puzzle, squeezing together and pulling apart to form oceans and landmasses of various sizes. In geology, Rodinia (from the Russian родина, or “motherland”) refers to one of the oldest known supercontinents, which contained most or all of Earth’s then-current landmass. Paleomagnetic evidence provides clues to the paleolatitude of individual formations, but not to their longitude, which geologists have pieced together by comparing similar strata, often now widely dispersed. Geologic evidence suggests that Rodinia formed and broke apart in the Neoproterozoic, probably existing as a single continent from 1 billion years ago until it began to rift into eight smaller continents about 800 million years ago. It is thought to have been largely responsible for the cold climate of the Neoproterozoic era. 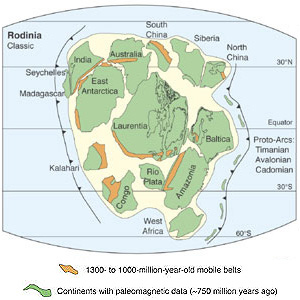 The arrangement of Rodinia has been hypothesized using paleomagnetic data from the Seychelles islands and India and the Grenville mountain belts, which were formed by the Grenville orogeny and span multiple modern continents, as references. Although the details are disputed by paleogeographers, the continental cratons that formed Rodinia appear to have clustered around Laurentia (proto-North America), which constituted Rodinia’s core. It appears that the East Coast of Laurentia lay adjacent to the West Coast of South America, while a conjoined Australia and Antarctica seem to have lain against the proto-North American West Coast. A third craton, what would become north-central Africa, was caught in between these two colliding masses. Other cratons such as the Kalahari (southern Africa), the Congo (west-central Africa), and the Sao Francisco (southeastern South American), appear to have been separate from the rest of Rodinia. Rodinia’s landmass was probably centered south of the equator. Because Earth was at that time experiencing the Cryogenian period of glaciation, and temperatures were at least as cool as today, substantial areas of Rodinia may have been covered by glaciers or the southern polar ice cap. The interior of the continent, being so distant from the temperature-moderating effects of the ocean, was probably seasonally extremely cold. (See continental climate.) It was surrounded by the superocean geologists are calling Mirovia (from mir, the Russian word for “globe”). Cold temperatures may have been exaggerated during the early stages of continental rifting. Geothermal heating peaks in crust about to be rifted; and since warmer rocks are less dense, the crustal rocks rise up relative to their surroundings. This rising creates areas of higher altitude, where the air is cooler and ice is less likely to melt with changes in season, and it may explain the evidence of abundant glaciation in the Ediacaran period. The eventual rifting of the continents created new oceans, and seafloor spreading, which produces warmer less-dense rock, probably increased sea level by displacing ocean water. The result was a greater number of shallower oceans. The evaporation from these oceans may have increased rainfall, which, in turn, increased the weathering of exposed rock. By inputting δ18O data into computer models, it has been shown that in conjunction with quick-weathering volcanic rock, this increased rainfall may have reduced greenhouse gas levels to below the threshold required to trigger the period of extreme glaciation known as Snowball Earth. All of this tectonic activity also introduced into the marine environment biologically important nutrients, which may have played an important role in the development of the earliest animals. 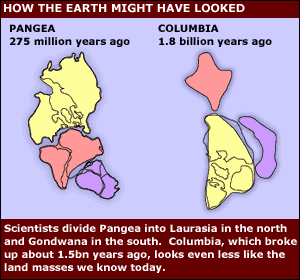 The eight continents that made up Rodinia later re-assembled into another global supercontinent called Pannotia and, after that, once more as Pangaea. You are currently browsing the archives for the Palaeogeography category.